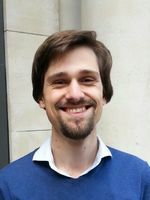 Bastiaan Bouwman is an MPhil/PhD candidate at the Department of International History of the London School of Economics and Political Science. His research focuses on ecumenical human rights promotion in the Netherlands and Britain from the 1940s to the 1970s. He received Bachelor's degrees in History and Philosophy and a research Master's degree in History from the University of Amsterdam, where he wrote on the rise of Amnesty International in the Netherlands. In 2013, Bastiaan was a junior scholar at the Woodrow Wilson International Center for Scholars in Washington D.C. The following year, he interned with Justice and Peace Netherlands, where he worked on the Shelter City project. Subsequently, Bastiaan was one of the inaugural fellows of Humanity in Action's Diversity & Diplomacy Fellowship.